So I was one weekend away in Omaha, Nebraska, visiting some friends, who are currently studying there and who I haven’t met for a long time! They showed me around the city and we by coincidence saw that there was a big food tasting festival going on. The city itself and the campus of the university were nice although it wasn’t really crowded as most of the students are gone at the moment. As I’ve heard from several people that the cops usually know the best places to eat, we asked some of them and they recommended us to Stella’s and without any doubt that was definitely the best burger I had so far in the United States! Another weekend I spent in Nashville, Tennessee, which was a huge surprise! I heard before that there a many bars with live music but the actual amount of live music stages throughout the whole city was just incredible! I was there one week before the Country Music Association Festival, one of the biggest country music festivals, took place, so a lot of preparation works were already ongoing and I could get a glimpse of an idea how crazy it would look like a week later. And if you ever get the chance to get to Nashville, go and visit the Johnny Cash museum! By a lucky coincidence, I found a really cheap flight to New Orleans, so I could not miss out on this chance to also see a little bit of the southern US. Although it was probably the wrong time to visit New Orleans because it was extremely hot and humid. Nevertheless, it was an incredible experience to explore the haunted city of New Orleans during day and night. So go on a ghost or voodoo tour and learn about the rich history of this amazing town! We are saving people’s lives on a daily basis at Fresenius! 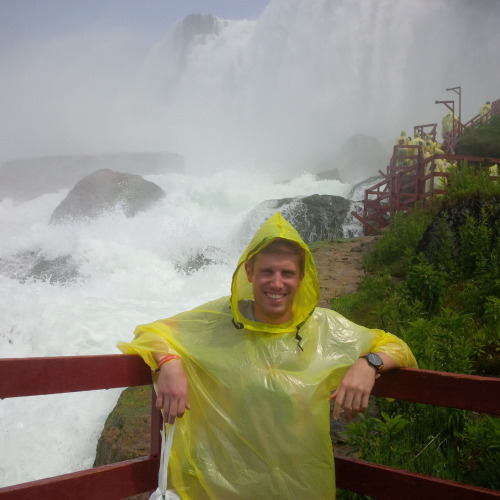 Right on the bottom of the falls… Absolutely incredible experience! Was definitely worth standing in the waiting line for about 2 ½ hours! Another hint, everybody is telling you the Canadian site is way better than the American but I highly doubt that because you can’t get that close to the falls from the Canadian site and so you will miss out on the most awesome part of this natural wonder! So without a doubt this spontaneous road trip was a blast! “Sodala!” as we say in my home region when we finished something and are ready to start with a new task. As I’ve finished the first Sharepoint project last week, I’d like to provide you with a few more insights on the actual project. It’s already a little bit late, but I’m currently enjoying working on my next project, so it took me a bit longer to share my experiences with you. This first Sharepoint project was kind of a training project for me to get used to the Sharepoint development environment but the cool thing about it is, that it was not only for training purposes. It is part of a bigger transition project and therefore it is actually now in use in a productive environment. But let’s start from the beginning, why we had to redo this search tool. The search tool for specific certificates was already in place on the local intranet for a really long time and made use of several old fashioned methods and programming styles. As the local intranet is right now in a transition phase, it was the perfect moment to replace this outdated tool with an updated version. So the first steps were to get all the necessary access rights to the development server and get familiar with the environment and its specific characteristics. The standard programming language we wanted to use was C#. As I was already used to the Visual Studio environment and VB.Net it was quite easy to get used to the programming language, as it’s quite similar except the syntax is a bit different. After getting familiar with the existing code and the possibilities to improve the code and the functionality, I started working on it. As I haven’t developed anything on a Sharepoint server so far, the biggest challenge in this phase was to learn about the many methods on the Sharepoint server. There are always several equally good ways to come up with a solution to a specific problem and figuring out which method works well for which issue can be tricky. With a clear goal in mind and after a lot of troubleshooting with a tremendous amount of lessons learned, I finally managed to come up with the desired enhancements compared to the existing application. The last phase in this project was the deployment phase. So this involved a code review and testing on the development server, as well as the deployment to the quality assurance server, testing again, documenting every step and every modification and getting all the necessary approvals for the implementation with the next change release to the production environment. In the meanwhile also a fun event took place in our Fresenius headquarter in Lake Zurich, the Bean Bag Championship! Even though I’ve never played this game before we luckily made it to the second round but unfortunately we were defeated in this round without any chance :-( however it was definitely fun to play and I will introduce this game back home to my friends. I know this was a text-heavy entry but I wanted to give you a little bit more insights in my actual work! But as one of the few well-known Austrians mentioned once in a while “I’ll be back!” soon with some more details about my exciting weekend activities! As promised last time, I am back with more details of my exciting internship at Fresenius in Lake Zurich, Illinois! After a look at my calendar after an amazing Memorial Day weekend away from Chicago (more details later on), I have just realized that three weeks have passed already. It’s incredible how fast time files if you are engaged all the time with stuff you like! Willis Tower, former Sears Tower, the second tallest building in the US! But back to my promise to tell you some details about my actual work. As already discussed during the job interview I wanted to get familiar with the SharePoint Server. Before the internship I only knew the system from an user perspective but thanks to Don, a SharePoint administrator for years, I’m also getting very valuable insights in the configuration and administration! Don takes time to show me something new every day and provides me with helpful hints all the time, while I’m working on my first project, which will be finished this week. This project is about improving an existing search application on the local intranet. As this is only a small part of a bigger project, there should be a lot to come and I’m looking forward to it! As mentioned in the beginning the Memorial Day weekend was awesome! I went with a friend to Indianapolis, which is only three and a half hours away, to the famous Indy 500 race and it was a blast! Beforehand I saw that this is one of the biggest sport events in the world with 250,000 people attending, but what I experienced there was way beyond every expectation! Hundreds of people everywhere, people renting their yards for parking, a lot of barbecue, a lot of sport enthusiasts as well as people who just went there for the party. Definitely worth to be a part of, at least once! The only downside of this awesome weekend away was the way back home…Originally it should have been only seven and a half hours, but due to a lot of traffic jams on the way we needed about nine hours. Anyways, these experiences were worth every minute in the traffic jam! So far, so good, but there’s a lot of amazing stuff planned for the next weeks, so you better stay tuned! Life is an adventure and Blind Applying is the living proof! I got to know Blind Applying late in 2013 (actually I heard about it for the first time a few days after the application deadline 2013!). It was like love at the first sight! I loved the idea of applying with one comfortable process for several internships at global companies. Seems like I’m just lazy but don’t get me wrong. Most of the current application processes are just cumbersome, for the applicants as well as for the recruiters. At the time I was preparing my CV for the application, I was in my third semester of my master’s programme in lovely Innsbruck, Austria. I was already excited because our university announced that we will do a study tour to Silicon Valley and the San Francisco Bay Area in early April. So we’ll get the chance to visit companies, universities, startups and accelerators and experience their (working) culture. The first surprise was when I was told that the video conference has to be in the evening because the internship will be in the United States! I was like “This sounds too good to be true…”, but two weeks after the interview I got a call from HR that they are more than happy to welcome me as their new intern in the IT department at Fresenius in Lake Zurich, Illinois! 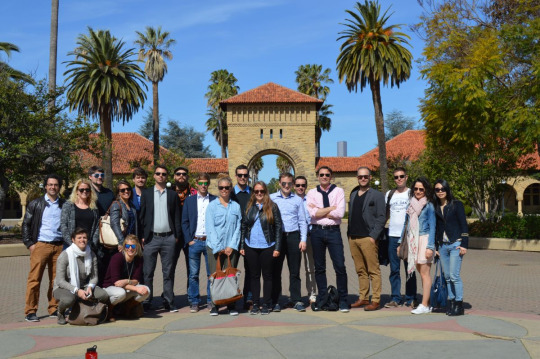 As my student life will be over soon, visiting Silicon Valley and working abroad in the United States seemed to me like the perfect end of an exciting period as a student! Due to the special circumstance that I would be in the States right before the internship starts, obtaining the visa was quite a burden, but with the help of Fresenius we’ve found a way to address this issue. The first part of this exciting journey lead me to Arizona, California, Nevada & Utah visiting several National Parks (Grand Canyon, Monument Valley, Antelope & Bryce Canyon, Zion), Las Vegas, Mammoth Lakes and Lake Tahoe before we were headed to the study-tour in San Francisco. The two week long study-tour with the university was mindblowing (I usually don’t like this word, but in fact, there’s no other to describe this experience!). We discussed with executives from established global players as well as we talked with entrepreneurs who just started their companies. This chance to learn about their views on innovation, entrepreneurship and the special mindset in the Silicon Valley was really a take-away no lecture could ever provide you with! One of our last visits were at Cogswell College where I found the following interesting poster. I thought that it fits perfectly to my next adventure, the internship with Fresenius at Lake Zurich! After this exciting opportunity I went back home for one week to pick up my visa and settle everything for a good start with Fresenius! I arrived in Chicago on the 1st of May, but I was a little bit exhausted because of several farewells the last days. However, everything worked out fine, the flight was on time, picking up the car was no trouble and also finding my apartment was an easy task, so I could enjoy the rest of my first weekend with perfect weather. On my first day at work I had a very warm welcome by Fresenius! I got introduced to my colleagues, showed around the huge building as well as I got a little tour in the surrounding area and I was invited to a nearby restaurant for lunch. I really appreciated all their support and want to thank you all because after this first day I didn’t feel lost anymore! The next few days I went through an official orientation programme, was introduced to all the systems in place and already got an impression on which projects I will be working during my internship. Were you expecting to do an internship in IT at Fresenius? I was pretty sure that in case I get chosen for any internship it would be in an IT department. I was not expecting it to be at Fresenius, nor that the internship would be in the US. When I received the first email from Fresenius, I was expecting that the internship would be based in Germany. It was such a great surprise to learn that the internship will be in Illinois. I got really excited! Are you thinking of doing any trips while you are in the US? Definitely. I will be in the US for a two week long study tour with my university in the San Francisco Bay area in April. I also plan to explore the West Coast on my own a little bit, before the internship starts. But I haven’t thought about any possible trips during the internship until yet. 3 songs that will be on your traveling playlist?